Is Colombia doomed to remain a right wing country? 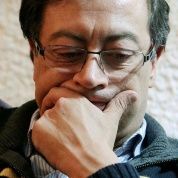 Left-wing presidential candidate Gustavo Petro. Colombia’s Ivan Duque – candidate for the far-right party of former President Alvaro Uribe – is in a strong position ahead of the June 17 presidential elections, despite Uribe’s long list of human rights abuses and links with paramilitary groups during his presidency. Duque’s rival, Gustavo Petro, has an impressive record of social, political and cultural achievements as former mayor of Bogota. He created 417 parks for children; built a dependency of the District University in the suburbs; opened an office dedicated to women and a ‘Citizen LGBTI Center,’ and launched other centers providing legal advice for women seeking to interrupt a pregnancy. Yet Petro is still struggling to gather the number of votes that would secure victory in the second round of the presidential elections, raising the question: why does the left struggle so much to gain a foothold in Colombia? Unlike the rest of the continent, Colombia was not forced to live under a military dictatorship during the 1960s and 1970s. Still, the country ranks first in the region in regards to the number of forced disappearances. More than 215,000 people were killed and 5.7 million displaced as a result of the conflict between leftist guerrillas, right-wing paramilitary groups and national security forces. Petro’s political enemies have emphasized Petro’s past as a member of former guerrilla group M-19 – born in the 1970s and demobilized in the 1990s – because voters in Colombia tend to conflate guerrilla groups and left-wing political groups. Moreover, leftist leaders don’t always make clear their ideological or practical divergences with the guerillas for the sake of public opinion. As a result, he said, Colombia has paradoxically shown consistent economic growth in the past 30 years, yet maintains the same level of social inequality as existed during the 1930s. This entry was posted on Monday, July 2nd, 2018 at 00:05	and is filed under Uncategorized. You can follow any responses to this entry through the RSS 2.0 feed. Both comments and pings are currently closed.